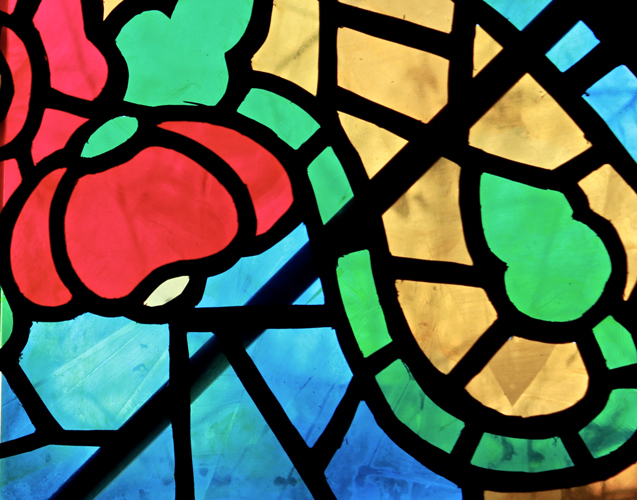 Project Description: Turn a plain window into a work of art with this Faux Stained Glass tutorial. Note: This took some time, but I really enjoyed the creative process. 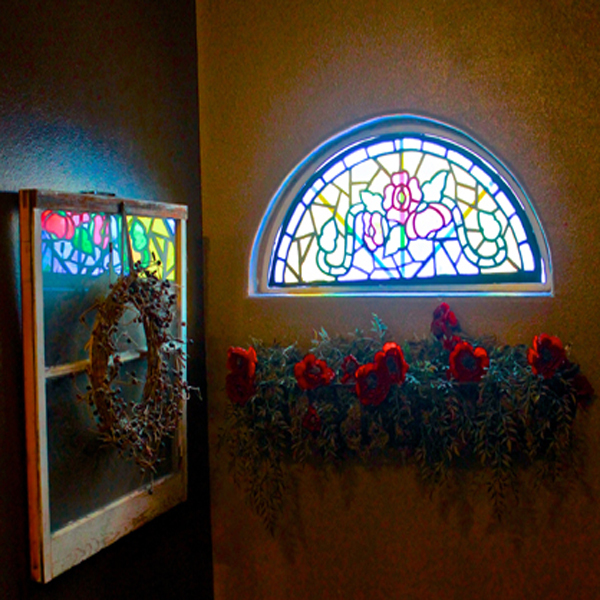 And the new window looks truly stunning in my entryway! I’m using two sheets of black poster board for this. (If you can’t find black, you can choose another color since we’ll be adding a coat of spray paint later.) Use your template to cut out the window shape on both pieces of poster board. If the poster board isn’t big enough, you can use adhesive to overlap pieces. Layer the two window pieces together. Use washi tape or masking tape to secure the pieces around the edges. You want the pieces to stay together as you cut, but you don’t want to press the tape so hard that it will rip the poster board when you peel it off. Sketch your design with a pencil on the top poster board piece. Remember that every piece you draw must have a ¼ inch border on all sides, to give the impression of window panes. 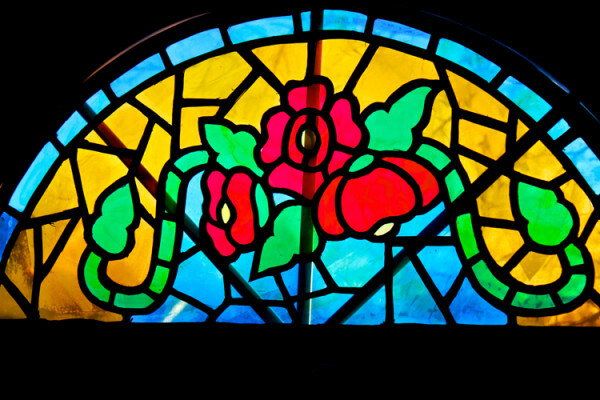 You can search online for stained glass inspiration. Use an X-acto knife to carefully cut out the pieces you drew. The blade is very sharp, so only a grown-up should do this part. Use a cutting mat, and always cut away from yourself. Cut through both the top and bottom poster board. Change the blade as needed. My poster board has a white core, so I’m going to add a coat of black spray paint to both sides of each piece. Be sure to do this in a well-ventilated area. Only an adult should use spray paint. I’m using Grafix colored Clear-Lay for this project. These are colored, transparent films. I want to vary the tint and opalescence of the film to better mimic real stained glass, so I’m adding alcohol inks. I’m tinting some sheets with Butterscotch colored ink and others with Pebble. Add drops of alcohol ink directly on the film. Use a cotton square to blend the color in a circular motion. You can add additional layers of ink to deepen the color and dull the clarity. Hold the film above the poster board so you can see the shape beneath. Cut a piece from Clear-Lay slightly larger than the shape. Adhere the Clear-Lay piece to the poster board with glue dots. Be careful that the glue dots won’t show on the surface of the Clear-Lay pane. Once you’ve filled all of the shapes, add more glue dots to the pane areas. Lay the second poster board on top of the first, being careful to align the cuts perfectly. You can use a mounting adhesive like Command Strips to place the window.